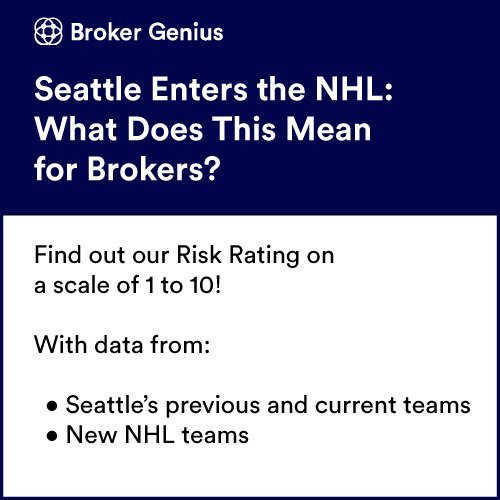 Broker Genius Risk Rating: Seattle Enters the NHL, Should brokers invest? Risk Rating: Seattle Enters the NHL, What Does This Mean for Brokers? Seattle will be the home of the NHL’s 32nd team. The city will join the Pacific Division for the 2021 – 2022 season and play in Seattle Center Arena, which holds up to 17,400 fans. This will be the NHL’s second expansion team in the last 5 years. What Can Brokers Learn From The SuperSonics? Seattle’s most recent move was when the SuperSonics left for Oklahoma City in 2008. This happened primarily because the new owner had roots in OKC and Seattle did not want to build a new stadium. The relocation was not reflective of a poor fanbase. Get the full report and our Risk Rating by completing the following form!